Washington D.C. — The Securities and Exchange Commission today announced that Merrill Lynch has agreed to pay a $12.5 million penalty for maintaining ineffective trading controls that failed to prevent erroneous orders from being sent to the markets and causing mini-flash crashes. An SEC investigation found that Merrill Lynch caused market disruptions on at least 15 occasions from late 2012 to mid-2014 and violated the Market Access Rule because its internal controls in place to prevent erroneous trading orders were set at levels so high that it rendered them ineffective. For example, Merrill Lynch applied a limit of 5 million shares per order for one stock that only traded around 79,000 shares per day. Other trading strategies had limits set as high as 25 million shares, which Merrill Lynch reduced to 50,000 shares after the SEC’s investigation began. According to the SEC’s order instituting a settled administrative proceeding, the erroneous orders that passed through Merrill Lynch’s internal controls caused certain stock prices to plummet and then suddenly recover within seconds. Among the mini-flash crashes were 99-percent drops in the stocks of Anadarko Petroleum Corporation on May 17, 2013, and Qualys Inc. on April 25, 2013. 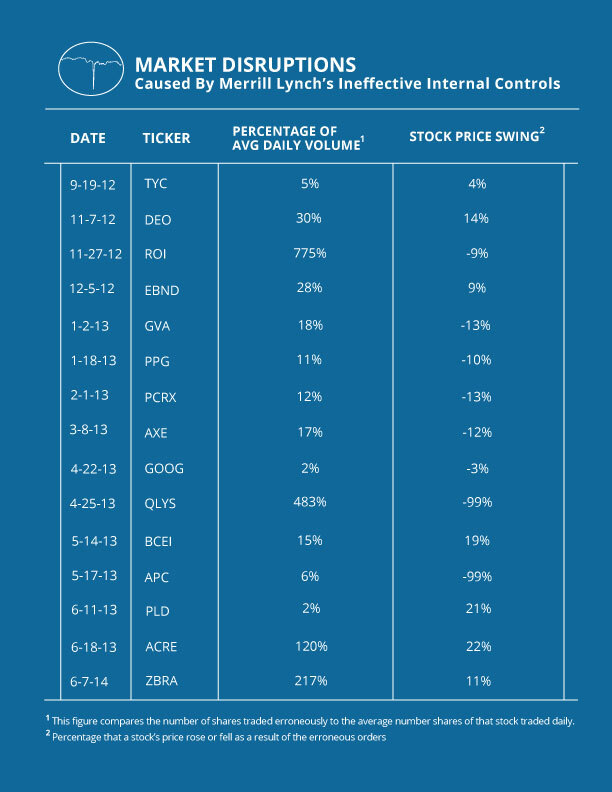 Another order led to a nearly 3-percent decline in Google’s stock in less than a second on April 22, 2013. The SEC’s order finds that Merrill Lynch also violated the Market Access Rule’s requirement for annual CEO certifications in 2013 and 2014. Merrill Lynch consented to the SEC’s order without admitting or denying the findings. In addition to paying the $12.5 million penalty, Merrill Lynch agreed to be censured and must cease and desist from further violations of Section 15(c)(3) of the Securities Exchange Act and Rule 15c3-5. The SEC’s investigation was conducted by Tara Kelly and Ainsley Kerr and supervised by Carolyn Welshhans, Yuri B. Zelinsky, Mr. Cohen, and Associate Director Antonia Chion. The SEC appreciates the assistance of the Financial Industry Regulatory Authority.